The Roman Catholic Church of Saint Joseph in Avon Dassett was opened in 1854. The church is in the Early English Style, the architect is said to have been Augustus Pugin's builder George Myers. At the opening ceremony the guests included the Bishop of Birmingham, and the Bishop of Southwark. The choir of St Chad's Birmingham was led by John Hardman who performed a Gregorian chant. All the stained glass windows in this church are by John Hardman many were installed at the church's opening in 1854, and the rest between 1857 and 1877. The East window has a central figure of Christ, within a vesica piscis, is sat on a rainbow that is above New Jerusalem. A number of Seraphim make up the ruby red background of the mandorla. Angels and the Dove of the Holy Spirit are above him. At the bottom of the panel are the symbols of the four evangelists. The lancets to the left shows the Virgin Mary holding a lily that symbolizes the Annunciation, and the lancet to the right shows St Joseph holding a flowering rod. The roundels beneath both of these lancets are dedicated to the donors Mary Knight and Joesph Knight who built the church. 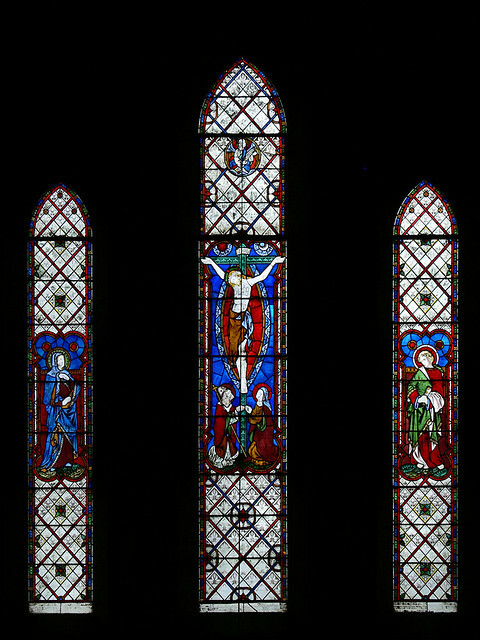 The window in the west wall is another crucifixion with the Virgin Mary and St John the Evangelist in the lancets to the left and right. At the foot of the cross are the figures of St Thomas à Becket and St Anne. 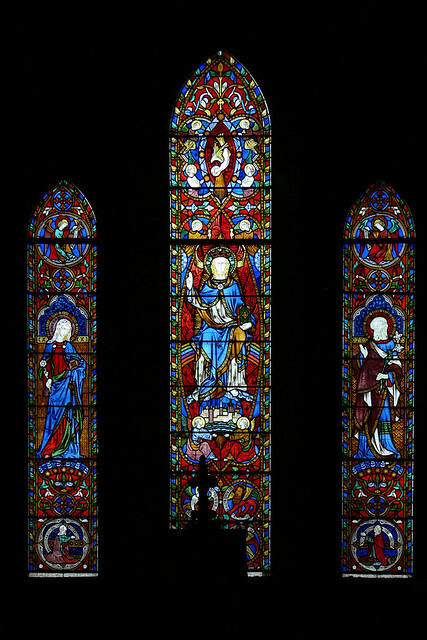 The window is dedicated to Thomas Perry and his wife Anne both of whom died in 1838.